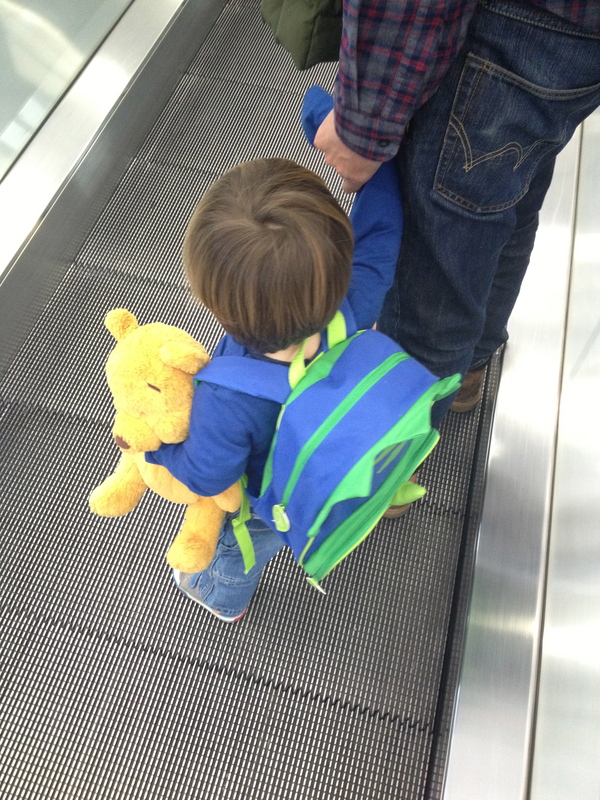 Houlton with Pooh and his SkipHop backpack. I’m really excited to share these backpacks with you… No, they’re not for your little one (though that’s fun too). 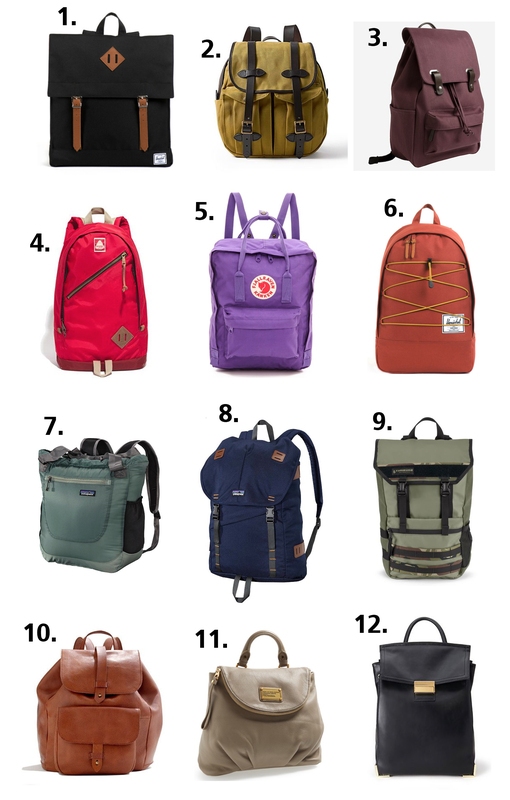 I’ve had backpacks on my mind for a while now — honestly it’s taken me longer than usual to pull this post together because there are just too many cute backpacks to choose from. It seems I’m not the only one who’s been thinking about backpacks — Refinery 29 has done several pack posts in recent weeks including this and then this one for sleek office styles. Needless to say, they’re all a lot cooler than they were the last time I went shopping for a book bag in high school. It’s somewhat surprising that there aren’t more diaper bags that are backpacks as they’re so nice for parents. For the early months, I love having all those little pockets to keep track of the absurd amount of essentials a little baby needs (multiple outfits, diapers and wipes, etc etc) but lugging a heavy bag around, even if it’s messenger style, gets old. Once babies are on the move, hands free makes such a difference giving you more freedom on adventures knowing you can comfortably wrangle your little rascal(s). So here’s my short list. And before you get in too deep, you should know that most (all?) of these styles come in a rainbow of colors. Oh my god Hershel! Who are these people? They have such a big selection (over a dozen backpacks in tons of colors and prints plus kids, other luggage…) and they’re all so cool. This one is definitely my top pick for it’s retro urban vibe. Oh wait, it’s got a red striped lining which makes it so much easier to find things in your bag. Filson is an authentic American “sportsman” company. Their products are built to last for years and years. This pack of of course nails the heritage look and according to the company website, you can use it for hunting and shooting too in addition to cruising around town with your red tricycle. Sleek enough for a commute, chill enough for the park, this Everlane pack is a refined version of the classic rucksack. It can’t just be the fox logo that makes this adorable right? The Fjallraven Kanken pack was originally designed for Swedish school children but it’s since been co-opted by hipsters and cute moms. I dream about getting a mini one “for my son” that I can wear around for him, you know, until he’s big enough for it. Or big enough to say he doesn’t want a pink backpack at which time I’ll just have to keep it. Another more sporty pick from Herschel. While those elastics straps may simply look cute and outdoorsy, they’re great for stashing your little one’s jacket when the sun comes out. This is my current pack — I’ve had it for eight years (wow, why is adding up years always so outrageous these days?) and it’s still in great shape. I love that it is super lightweight — great for packing on a trip — and durable so I never worry about throwing in groceries, dirty clothes, or whatever else I need to carry. Bonus feature: it can be used as a tote or a pack. This new style from Patagonia caught my eye — I love that it has a great retro look without sacrificing any sporty function. Timbuk2 makes such great quality bags and I love the hit of camo on this one. When you go with a more outdoorsy choice, you get great features like extra pockets, ventilated backs, more comfortable straps, and a bottle opener (“for hydration emergencies”). That’s not a typo. A classic leather rucksack that you’ll have for years and years. This Madewell version is definitely a step up for the playground without looking too posh. You’ve seen these Marc bags around and now there’s a pack version to try. I’m not a big fan of cheap/fast fashion but since you’re probably not in the market for this Alexander Wang, perhaps you want to try the purse pack thing with this knockoff version. If you’re into the idea of a leather backpack that’s as nice as any other handbag in your closet there are so many choices right now. A quick search at your favorite luxury department store will reveal dozens upon dozens in the 4 figure range. Maybe we should have a contest on who can find the most expensive one? I do think the best investments are the convertible ones like this Loeffler Randall style. You can use it either way now and in the future, if you move on from backpacking, you still have a lovely shoulder bag. P.S. The photos below from Loeffler Randall are exactly why I love accessories so much. Her outfit couldn’t be simpler but she looks so cool. It’s obviously the shoes! Loeffler Randall Lock Backpack worn two ways.